In the heart of the busy city or in quieter areas. You can find great deals at many of the top hotels, so that a Mazatlan resort vacation can be reasonably priced, especially if you don’t go around Christmas or Easter, when sometimes it seems as though all Mexico goes to the beach! If you do go then, be sure to make reservations. Many of the hotels have swimming pools, restaurants, gift shops, and other nice touches. You won’t be suffering! The grand old Hotel Posada Freeman, built in 1949, has had a great renovation. 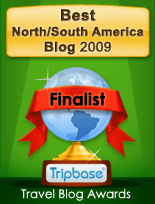 Other top-notch Mazatlan hotels include the Aguamarina Hotel and the Pueblo Bonito. Resorts include the El Cid and the Royal Villas. 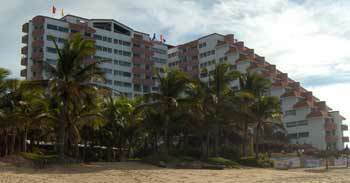 Mazatlan is full of condos, and you are likely to be approached by condo sales people. If you get interested, do plenty of homework and don’t be pressured. Some are time share situations, and others you could live in year-round. The photo shows one that we stayed near recently, right on the beach.